In your WordPress dashboard, edit an existing form or navigate to Contact > Add New to launch the Contact Form 7 new form template. At the top, add a new hidden text field as follows. To make it easier to follow along, use the same code and naming conventions that you see in this post. Still in the Contact Form 7 settings, click the Mail tab. Add the new textarea field to the Message Body section. This is so the contents of the hidden field automatically get emailed to you when the form is submitted. Navigate to Tags > New > Custom HTML Tag and paste in the following script. 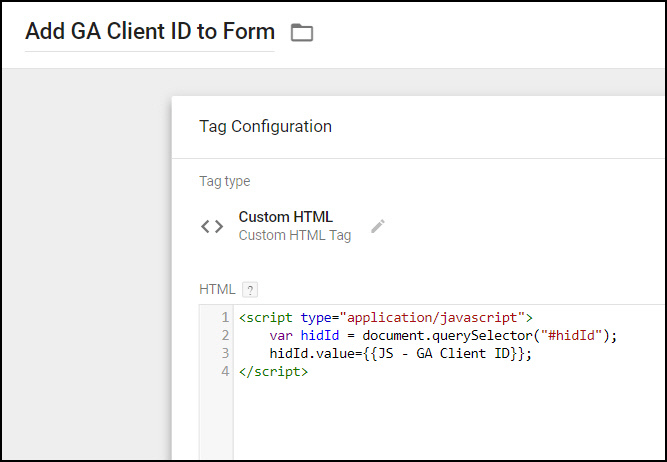 This will identify the hidden form field from step 1, and populate it with the client ID variable. 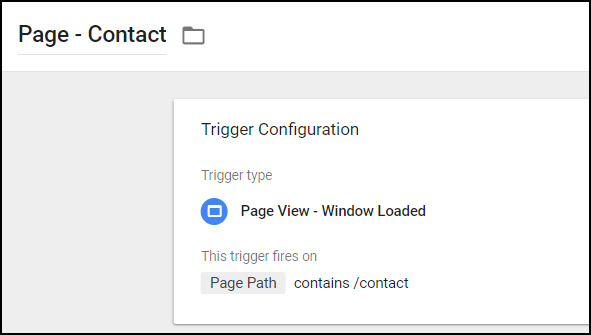 Create a trigger that fires on your contact form page, e.g. Page Path contains /contact. Window Loaded, as opposed to Page View, fires only after the entire page and all its linked images, libraries, etc. 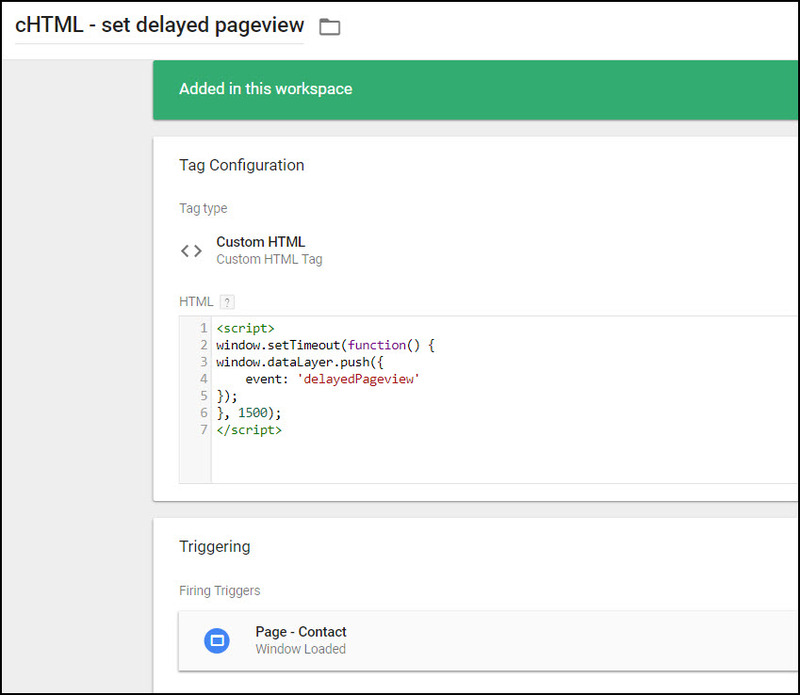 have loaded, while the Page View trigger fires as soon as the GTM container loads. The script to grab the GA client ID needs a few moments to run, so in this case it’s important to use Window Loaded trigger type. Return to the tag you created in step 4 and add both of the above triggers to it. This means the client ID will first be pushed into the field upon window load, and then again 1.5 seconds later. It’s redundant but more reliable this way. 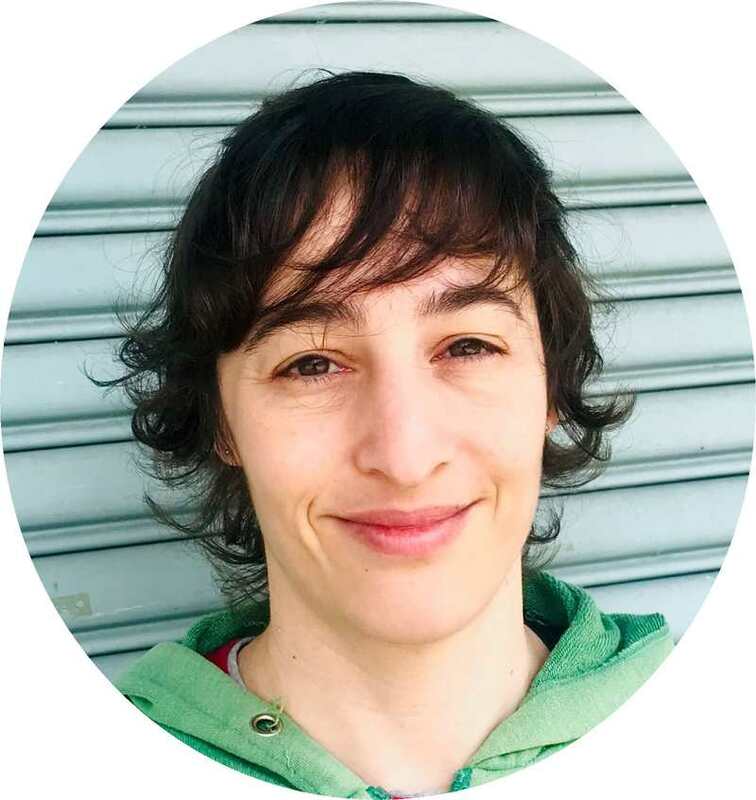 GTM is a container for other tags. So if you implement GA via GTM, you would need to remove your on-page GA code to avoid double-counting. Thank you, it works nicely…. mostly!, however, Sometimes i get the email from some clients not including the Client ID, sometimes I get it having the “Undefined” and sometimes the value is blank… not sure why that happened… i tested that in Chrome, Edge and Firefox while making the hidden field visible and found the field get populated with the client ID, however, if I tested it on Firefox Private model the field don’t get populated! Firefox Private mode blocks GA tracking. That means that there is no GA client ID for that user, and they won’t show up in the form field or in your GA reports. Other add-ons / extensions also block tracking, so in some cases the GA client ID also won’t be available. I’m not sure why you’d get an ‘undefined’ though, let me know if you have any more details on when that happens and I’ll try to dig in a bit. I have 4 Contact 7 forms and I’m using a plugin to send the form details to a google spreadsheet after submission and to Mailchimp (If the visitor ticked that newsletter checkbox), I made the id text field visible for you under the submit button to make it easier for you to debug. Unfortunately, i couldn’t get the client id of over 30% of the total submissions. I tested it and sometimes on Chrome on android phone i get “Undefined” on the text field same as many of my visitors submissions and also some my visitor get the text ID blank (not sure which browser those with blank textbox are using). I tried to use the same textbox ID name with all 4 forms and also tried to use different text ID for each form (ex. hidId1, hidId2 …) and added your snippet to the tag 4 times with the different IDs but i got the same result, “blanks and undefined”. and sometimes some of the forms get “undefined” and other forms work properly! After submission, the page will redirect to a page with call to action button “create a review” that has a GA event set for it, My goal is to identify the ones who didn’t click on that create review button and maybe identify them in the MailChimp list or on the google sheet list so I can target them with a followup email after they receive there gift. Since Google doesn’t allow to send a personal info to GA so I thought your idea could be the solution which is to collect the client ID for each email and match it with the GA data to identify which ones who didn’t click on that button. In case if there were no solutions to make your idea more reliable do you suggest anyway to achieve my goal in a better way, maybe by updating a mailchimp mergetag for each subscriber with the result of the GA goal completation result or something like that. I checked your 4 forms and all populated correctly 100% of the time in my tests, so it’s a little hard for me to troubleshoot. 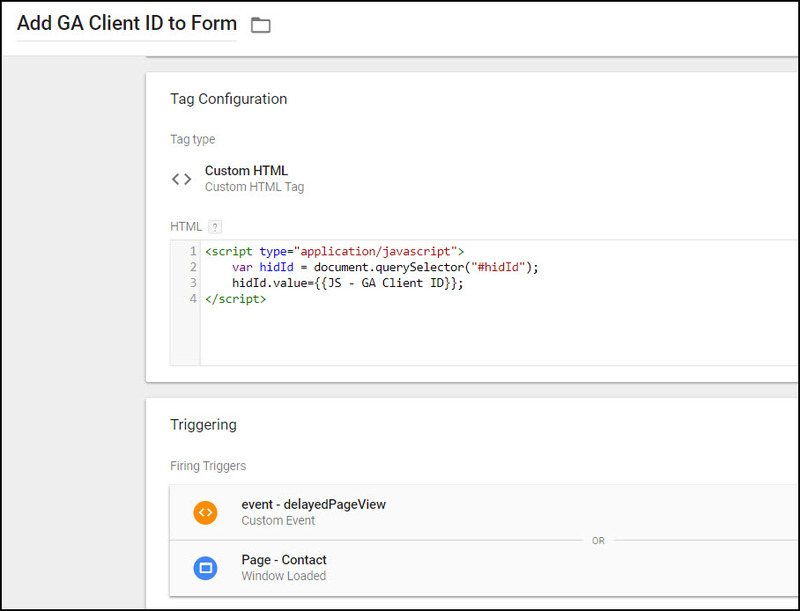 My best guess is that on slow connections/devices, the client ID isn’t always ready by the time the form field logic runs. 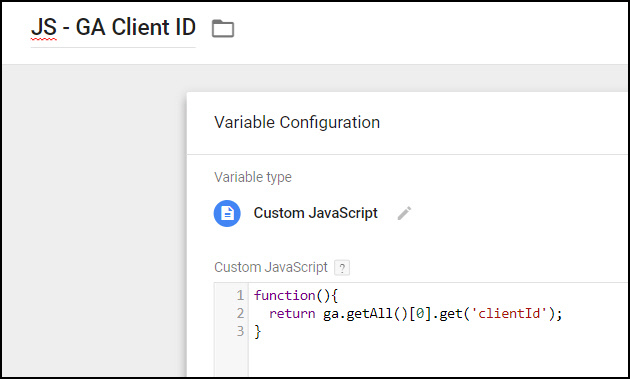 4) add this new trigger to your original “push the client ID” tag from step 4. It looks a bit convoluted, but essentially it’s just creating a delayed trigger 1.5 seconds after the first, and then populating the field via both the original trigger and the delayed one 1500 milliseconds (1.5 seconds) later. I’m not really sure about alternate methods, but please try the above and let me know how it goes. Thanks so much again for your reply and help, I have a feeling that delayed page view would solve that issue, I tried it on Android/Chrome and saw the textbox value turn after 1.5 seconds from from “undefined” to the client ID so I think that could solve the issue however i won’t be certain before maybe 1-3 days to collect some real visitors submissions. I will let you know if it completely solved the issue in case you wanna update the post with that delayed page load trick. btw there was a small typo on your snippet… it’s the apostrophe on ‘delayedPageview’ … it should be ‘delayedPageview’ otherwise GTM will give an error. Great, thanks for your update and for catching the delayedPageview thing, it will be useful if anyone else reads this later. I think it’s an issue with how WordPress encodes characters. Please let me know how it goes, I’ll update the post if it works out. Thank you for coming back with an update! I appreciate it and will update the post.